Chrome developers are trying ease the browser's demands on CPU resources. 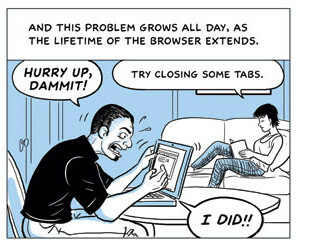 A recent commit to the open-source code introduces a "Never-Slow Mode", described as an experimental browsing mode that restricts resource loading. However, the developers warned in a description of the flag that it "may silently break content!" The changes won't reduce the memory footprint, but may well succeed in reducing CPU usage on pages that are not being viewed – as it does not apply to worker threads. The aggressive move will block large scripts and reduce IO and XMLHttpRequest (XHR) calls to the web server. Ironically, the latter was invented at Microsoft in the 1990s. Use of synchronous XHR when the server doesn't respond causes a page to stall, and it has been deprecated. Google's Chrome browser will be the main beneficiary. It grabbed 67 per cent of the desktop market in January, according to NetMarketShare, compared to Firefox at just 10 per cent, and 62 per cent of mobile, compared to Safari's 26 per cent. Vivaldi, Opera and Brave already use the Chromium engine, and later this year Microsoft's Edge will too. Chrome was introduced a decade ago with performance in mind. It's hard to recall that at the time the newcomer was considered fast and nimble.